A couple days ago in family altar we sang the following hymn. We are singing through the hymnbook, working our way through 2 catechisms, reading Scripture, praying, and at times discussing whatever is important during our times of family altar. God made this song so precious to us. I got choked up and we sang some of the verses several times. Enjoy. There's a kindness in His justice Which is more than liberty. There is mercy with the Saviour; There is healing in His blood. And our lives would be all sun-shine In the sweetness of our Lord. I love that song too. Good post! I have never heard that song but, I really like it. Thanks Phillip. 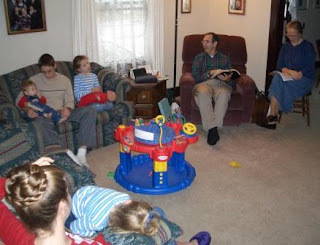 Phillip, I love the photo of your family worshipping the Lord. Also I love the words to the song, but I've never heard it. Why don't you and your family record it and post it here for those of us who haven't heard it? Love you guys. You may not ever read this since I am posting way "ex post facto" :). I want you to know that I try to think of and pray for you every week. I admire your obvious dedication to Christ and know that you are enabling Him to do wonderful, beautiful things through your lives. It was neat to see you in our family devotions - I thank God for parents who did what that picture shows for more than 24 years (my lifetime). May God bless your family in His incredible ways. I hope that someday I can come visit your ministry in Colombia.